Would You Like a Simple Tool to Help You Solve Your Problems and Bring More Joy and Fulfillment to Your Life? This Healing Prayer ebook includes 23 prayers to cover many life situations. They will help you raise your vibration and align to your highest wisdom. As you expand your awareness and vibration it will assist your understanding of your life situations with greater clarity. 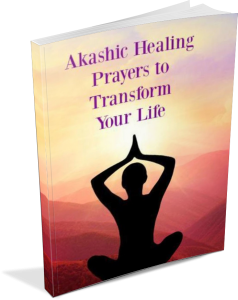 As you use these healing prayers you will also be starting a relationship with your Divine Soul Guides and Akashic Beings of Light.